Is it too early to start thinking about Christmas Trees??? I know its just the middle of Novemeber, but its never too early to think about christmas trees. I have to say that Christmas is my favorite holiday and not just because of presents, but I love all the holiday cheer. I know, I know, its cheesy, but it's true. I love sitting back and watching people get all excited about decorating, and in the malls and shopping centers, everyone is buying other people gifts. I grew up all over the place, but Christmas's were almost always the same, there was food, a decorated tree and great friends and family- just a different place. I have had some crazy holidays too where I didnt have anything, no tree, not great food, but at least I had my health. Even if I didnt have any presents or any money, I stayed positive, and was just thankful to be alive. There are many people out in this world who are not able to have a holiday like many of us do, such as military, people who are incarcerated and homeless people and so much more. This christmas, I can finally spend it at home with my family and good friends. It's been years since I have had a christmas, the last christmas I spent was with my grandmother and family in florida, and she passed away a year ago. Over the years, I realize how important being with family and caring for each other is. ok, ok, I am getting way off subject! Sorry about that, I just start rambling on and on. 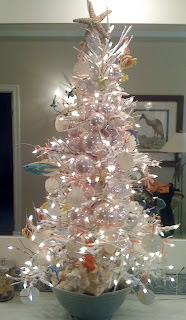 But the main reason I wanted to blog today was that I was searching for christmas tree decorations, and I searched to see if there were any tree decorating contests out there, and I found one! 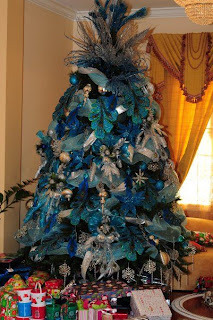 Check out some of these tree submitted by people all over the world, so far only 30 people have submitted their trees. in 2009, over 600 people submitted pictures of their decorated trees! Here is my favorite one! I love how people are getting so creative! This one has peacock feathers in it and it just looks amazing. I found this other tree too, and since I love the ocean and live at a beach, I wanted to save this pic too. This year, I will be buying a white prelit christmas tree from walmart. As much as I love real christmas tree's, There are just too much work, and I want a tree that will last and i can use over and over. I hope everyone has a fun time getting ready for christmas!